Just as I became obsessed with Greek food (like chicken souvlaki and Greek salad) after our trip to Rhodes, I’ve returned from Istanbul with a hunger for all things Turkish. The incredible flavors, intoxicating scents, and evocative spices have left their mark on my palate, and I find myself trying to recreate little bites of our trip at home. As I mentioned in my post about where to eat in Istanbul, the first place we ate when we arrived was a wonderful, no frills kofte restaurant that had me craving these Turkish meatballs for the rest of the trip. In Turkey, kofte refers to small, flattened patties of ground meat (usually beef or lamb) that are somewhere between a slider and a meatball. They were most often served simply with rice pilaf, so my version on a pita is a departure, more like something you would see in Israel. I also didn’t have them in Turkey with any kind of yogurt sauce, but in my book everything is delicious with yogurt sauce (obviously leave this off to make it kosher). While in Istanbul a trip to the Spice Market is a must for any food lover. In addition to the Turkish delights (lokum) and Iranian saffron that I stocked up on, I also purchased “meatball spice” from the Ucuzcular spice shop. A mix of cumin, sweet paprika, allspice, black pepper, coriander, nutmeg, ginger, and cinnamon, this is a common Turkish spice mix that instantly transforms ground beef into Turkish kebab. Obviously if you don’t have this concoction then wing it with some combination of the above spices; not very technical or precise, I know, but I do believe it will leave you with the general flavor. If I were mixing it up myself I’d add just a pinch of ground nutmeg, ginger, and cinnamon and be a little more generous with the other spices. The lovely folks at Ucuzcular were also nice enough to email me a booklet of recipes highlighting their spices. This kofte recipe is an adaptation of theirs, and it was absolutely delicious. The spiced meat was flavorful without being overpowering, and the dish couldn’t be easier to prepare. My husband, always my biggest fan, declared them the best kofte he’d ever eaten. These Turkish meatballs are very good replicas of the ones we ate in Istanbul, although there they would typically be served plain with rice pilaf. Leave off the yogurt sauce to keep this dish kosher. Put the ground beef, breadcrumbs, egg, onion, parsley, meatball spice, and garlic in a large bowl and mix thoroughly with your hands until well combined. Form them into 16 or so small, flattened meatballs. Lightly coat each kofte in flour. Put enough vegetable oil in a large skillet so that it is well-coated and heat over medium-high. Add the kofte, working in batches if necessary, and cook, flipping once, until done (about 5 minutes per side). Serve with plain rice pilaf or, as I have here, on a pita and topped with mint yogurt sauce. Garnish with torn or chopped mint or parsley. Put the yogurt and mint in a small bowl and stir to combine. Serve immediately or store in a covered container in the fridge. Kosher meat if yogurt sauce is omitted (it's still delicious!) Can be made gluten free with GF breadcrumbs. I think I could easily become obsessed with these! I want that for lunch right now! I’m a huge fan of meatballs – how can’t you be!? Oh i love these, i make very similar ones all the time. I was just thinking about making meatballs. You are always a step ahead of me, Ms. Martinelli! Delicious! I love those Middle Eastern meatballs, but I usually mix in some lamb. I have to start playing with spices more! What a fun blog hop! Thanks for hosting! 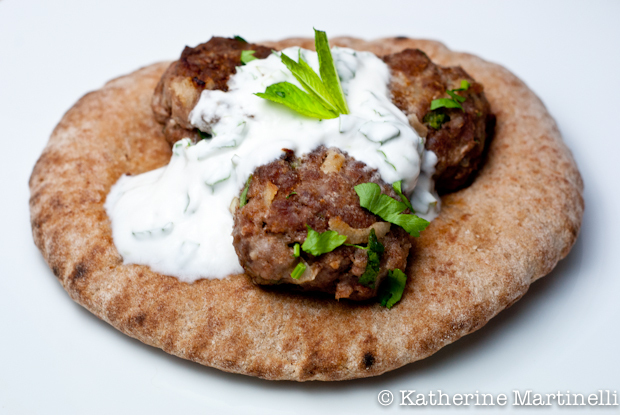 Your dish looks amazing- I love kofte especially with a yogurt sauce! Thanks for hosting another great blog hop, I shared by Quinoa Spaghetti with Turkey Meatballs. Have a great weekend! These meatballs look delicious and I love a good yogurt sauce. Nice use of pita, too! I got excited to see you were doing meatballs this week! Yay!!! I’m linking up two recipes – my Spaghetti and Meatballs and my Crockpot Cocktail Meatballs. I am absolutely in love with your Turkish Meatballs. I would love that for lunch today! The seasoning sounds absolutely delicious! Great idea for the blog hop. I added some international variations of meatballs. Those look delicious and remind me of little pita pizzas. All of your recipes always look SO good! I’m hungry now! Your kofte looks incredible. I think w’re on some planetary wave length, because I made them too – with a yogurt-mint-cucumber sauce lol However, yours are simply gorgeous, and I love them on the pita! I’ve never put mint in my yoghurt sauce but this looks fantastic! I’m glad you had good time at Turkey Katherine, it is true that the spice market in Istanbul is the best one that you can find in the whole Mediterranean area and has a great history too. It’s no wonder that you loved the Turkish cuisine, it’s very similar to Greece’s. Every country has influences from neighbors.. I love the dish, I;m not skipping the pittas and your lovely sauce how could I? this is exactly how my family makes kofta! Luuurve kofte 🙂 gorgeous recipe! I really love kofte and yours looks absolutely delicious. I was tipped off about the blog hop by Willow from Will Cook for Friends, so I’ve added a Norwegian meatball recipe! Thanks so much for hosting! I love meatballs. I consider myself a wannabe-vegetarian, because I find most meat to be distinctly un-tasty. But meatballs have won me over recently. Thanks for featuring so many great ideas. I have nominated you for the One Lovely Blog Award! Stop by my blog for the details 🙂 Have a good day! I contributed a chicken meatball, and I hope you know about the new I Love Meatballs cookbook! I will hook it up so people can see it, too. It’s really good. I love kofte and you did an amazing job, Katherine! Congrats on top 9!!! This is where I become a very wimpy vegetarian. 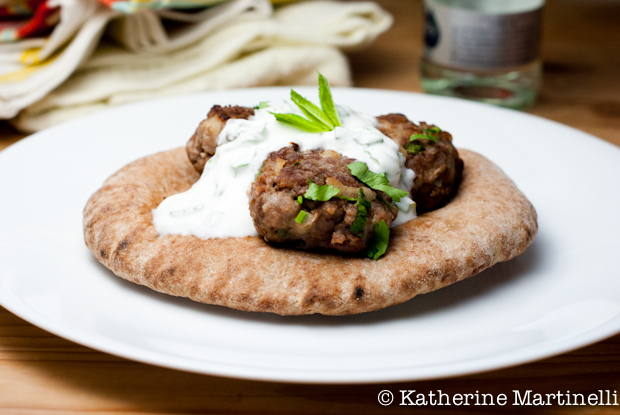 I love kofte, and will have to make these!! Many congrats on Top 9!! There is a restaurant here that serves a delicious Kofte with mint yogurt sauce and I absolutely love it. I’ve never made it before, so I’m thrilled that you shared your recipe so I can make it at home! This looks SO good and so do all these wonderful links to meatball recipes! I love all of the world’s small spicy meatball-like things! So many great flavors. If one were inclined to (I’m not!) you could probably do a post a day for a year on all the various varieties and permutations. Anyway, this is a particularly nice rendition – good job! Yum, yum, yum. I love this type of cuisine and will now have to try this spice mixture on my meatballs to turn them into kofte! I want to go to the spice market in istanbul too!!! meatball spice?? wow I need to make that or get it! Katherine this is wonderful. I want to do a freaky friday with you. Please! Excellent recipe Katherine! And a lovely idea for a blog hop! Looks like you had Top 9, congrats Katherine! I was surprised that I didn’t have my favorite meatball recipe in my blog to join you. Your Kofte looks amazingly delicious! I also love the mint yogurt sauce you made.